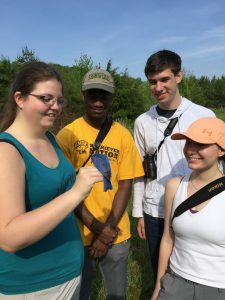 Evangeline Rose: PhD student finishing up her dissertation on the structure and function of female song in Eastern Bluebirds. Previous work in our group helped demonstrate the evolutionary importance of female song (Odom et al. 2014). 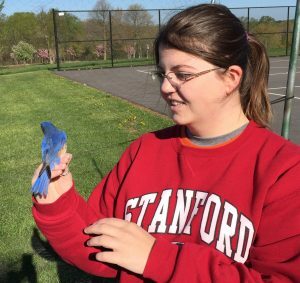 Now Evangeline has an ideal experimental setup for testing several possible anti-predator functions of female song in bluebirds. 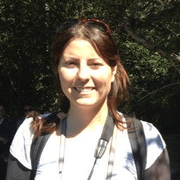 Her first publication came out in Animal Behaviour in 2018. 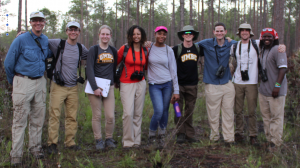 Shown doing fieldwork with undergraduates in nearlby Howard County. 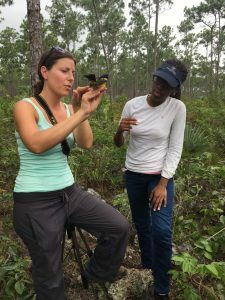 Janine Antalffy: PhD student working on habitat mapping and conservation genomics of the Bahama Oriole. Shown in the field on North Andros with Bahamas National Trust intern. 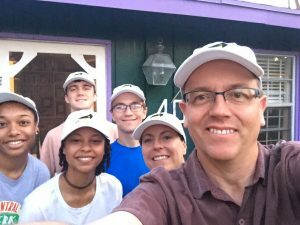 Undergraduate Researchers: We have dedicated teams of undergraduates working on both the Bahama Oriole Project (below) and the bluebird female song project (see above). Kevin Omland, PI: faculty member at UMBC since 2000; named UMBC Presidential Research Professor for 2016-2019. Click here for more details and publications.